Reginaldo started his career in games 16 years ago when he founded Jynx Playware – a pioneer in online multiplayer games in Brazil. In 2010 he took the lead of Glu Mobile’s studio in Sao Paulo where he released Blood and Glory, first and only Glu’s title to date to secure a 5 stars rating. Reginaldo moved to Berlin in 2012 for a brief passage at Wooga and later on at Aeria Games, where he learned the game business from the publishing side. Last fall Reginaldo realised Germany was not cold enough and moved to Finland to be Head of Production for Rovio Stars. 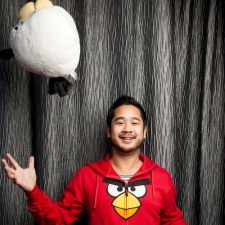 Patrick Liu has left his position as General Manager at Rovio Stockholm to join Spotify as Senior Product Owner. Replacing him is Reginaldo Valadares, who has been promoted from Head of Production. Previously he has held Studio Head roles at Aeria Games and Glu Mobile, as well as a stint as Product Lead at Wooga. "Rovio Stockholm has excelled in performance this year and brought Angry Birds 2 all the way to its peak top grossing position in the US: #23 in iOS Games," said Rovio EVP, Games Wilhelm Taht. "Patrick, as Oskar before Patrick, has done a tremendous job taking the studio and its products to where they are now. "Now it’s time to pass the Rovio torch to the heavyweight industry studio executive Reginaldo Valadares, who has over 17 years of experience running game studios. "Reginaldo has stepped up as head of Stockholm studio two weeks ago already and is now scaling up the studio as we speak. If you feel like joining the magic and leading the studio in its mission to set the world on fire; drop Reggie a line on Twitter @valadares." The departing Liu joined Rovio as Creative Director in 2012 from Battlefield developer DICE. He eventually took over the role of GM at Rovio Stockholm from the outgoing Oskar Burman in March 2016. His new role at Spotify is his first outside the games industry for 11 years. "There are many reasons for me to leave Rovio," he told PocketGamer.biz. "Or rather, there are many other exciting things to do outside of Rovio. "It's not an easy decision to make. Having been part of founding Rovio Sweden and shaping it to what it is today, I'm of course highly invested in it. "I have learnt a tremendous amount in the last four years about building and running a studio, the mobile F2P business and developed a lot on a personal level as well. "Keep in mind that we started just before Candy Crush and Clash of Clans were de facto successes, so a lot has happened since then to say the least." The last time Liu followed his instincts and made a leap like this, it was from console and PC game development to the world of mobile free-to-play in 2012. "When I found out I was engrossed in mobile games, I took a huge step from boxed premium products to nimble digital services," he recalls. "The next step is even bigger. I'll try my wings outside of games, something that's been such a big part of my identity. "I can safely leave Rovio Sweden as Angry Birds 2 is doing better than ever before, and I already have a successor that's taken over. I'm super hyped about all things happening at Spotify, pioneering what is to come. As Luke Cage says: always forward."